The Yashica FR is a 35mm single lens reflex camera, introduced by the company in 1976. 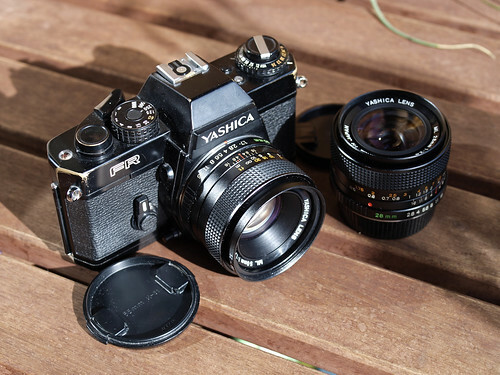 The FR and its later offshoot, the FR I, marked the first time that Yashica attempted to compete in the 35mm professional and serious amateur markets. The FR features an electronically-operated, horizontal-travel, cloth focal plane shutter with speeds from 1 - 1/1000 sec. It is a manual-focus SLR camera with manually set exposure controls, and aperture and shutter speeds are visible in the viewfinder. Instead of the normal mechanical shutter button, the FR is fitted with a 'Feather-Touch' electronic release. It is fitted with the Contax/Yashica bayonet lens mount, allowing the use of either Yashica or Carl Zeiss T* lenses. The camera was available with a power winder, and can also accept an available Contax motor drive and infrared remote shutter release. Shutter button: Electromagnetic shutter release button. Metering: TTL full aperture with CdS. In finder LED metering from 12 ASA to 3200 ASA. LED exposure system with green correct, and red for under or over exposure. Finder: 92% field of view, displaying shutter and aperture scales. Focus: Split-image center spot with microprism. Flash: Electronic X sync at 1/60 or slower. This page was last edited on 19 March 2019, at 06:20.